Loud drums, loud bass and chemistry. This is the story of the Saints of Valory, never fully told or published until now. Before you go any further, know that if you ever decide to take on chronicling a band’s history, take my advice and get all of the band members together in one room, chain them to their chairs and get all your questions answered in one sitting. Anything short of this is likely to drive you insane. This article has taken literally days to write, hours of conference calls and numerous revisions. But in the end, it’s worth it because the story you are about to read is from the band members themselves. They dug through their emails and had their own conference calls to get the sequence of events just right. So sit back, grab a drink and get to know this band. I had the privilege of an exclusive interview with Saints of Valory’s own Gavin Jasper and Stephen Buckle, at The Belmont in Austin on June 12, 2012. Godfrey Thomson also added his input to me via email and many phone calls. Their story is one of fate and discovery. It is about perseverance, moving forward and taking risks. Most of all, it is about chasing the dream and never letting go. Believe it or not, the origins of the band began overseas. Growing up, Stephen, Gavin and Godfrey’s parents were missionaries. Gavin and Godfrey met in Rio, Brazil and the two kids quickly became friends. With their childhood bond and a mutual passion for music, Saints of Valory’s story begins. Though their families went separate ways, the boys stayed in touch. Throughout the years, Gavin continued creating his own music in Brazil, while Godfrey started his own band and met a young drummer from France named Gerard. In 2008, nearly 20 years after their childhood friendship began, Gavin and Godfrey reunited in Brazil. Godfrey brought Gerard with him, and the trio decided to form their own band together. Their original plan was simple: write and record a few songs, then hit the UK. Gavin and Godfrey disagree on this next point. According to Godfrey, the three-man band was solid. But Gavin didn’t think their sound was very good at first. Both Gavin and Godfrey do agree that their recording and rehearsal space in Brazil was less than ideal. Overall, they were having fun making music, living it up in Rio de Janeiro, playing soccer and surfing together. Life was pretty carefree. When they first started jamming together and were figuring out their sound, their very first fan was an Afghan Hound. She loved their music and would show up in the studio whenever they practiced. The band didn’t have a name yet. The guys started tossing around a few ideas, including the Young Sons, the Sparrows and the Sons of Valory (after Gerard’s mom, Valerie). Gavin really liked the Sparrows, but the idea was nixed because of an Australian band by the same name. Godfrey was partial to the Sons of Valory, but it didn’t stick at the time. The search for the perfect band name continued. Gavin had watched an interview on television with Stewart Copeland, the drummer from the Police. He thought to himself that the Police had the greatest band name ever – a one-word name that everyone could remember. After talking it over, Gavin, Godfrey and Gerard decided that their band should have a simple one-word name too. They named their band after their very first fan: the Afghan Hound, Diana. After two months of writing and recording in Rio, Diana came away with a handful of songs, ultimately recorded at a makeshift studio in Gavin’s home. The songs still needed to be mixed properly, and each of the guys had stuff they personally needed to take care of, so the band members went their separate ways. Godfrey took the songs Diana had recorded, returned to his studio in Atlanta, GA and finished mixing them. He had already been using his studio to successfully record music for film and television, so it was natural that he would be the one to finish mixing the recordings. Gerard, originally from France, went to Monterrey, Mexico to be with his family who owned a restaurant there. Gavin remained at his home in Brazil. In early 2009, MySpace was a pretty big deal for bands, so Godfrey uploaded Diana’s new tracks. Within a week of posting their songs, on January 28, 2009, Fuel Records in Orlando called the band expressing their interest. Fuel said that they liked what they heard and wanted to sign Diana right away. But the label wasn’t too hot on the name Diana and suggested the band members come up with other ideas. Among the names to resurface were the Young Sons and Sons of Valory. Then Gavin suggested Saint Valory, which immediately resonated with both Gerard and Godfrey. But Godfrey, who had intially come up with Sons of Valory, offered a twist saying, “What if we called ourselves Saints of Valory?” On April 21, 2009, the band knew that they had discovered their new identity. Keep in mind that at this point, Saints of Valory had never played a single live show together. The band scrapped their original plan to take their music to the UK. Instead, they decided they needed to get into the States to perform live for Fuel Records. But they had two little problems. First off, they were still living in three different countries. Secondly, Gavin didn’t have a Visa for the States. The boys had their work cut out for them. On May 25, 2009 Gavin traveled to the U.S. where he met with Godfrey and Gerard at Godfrey’s studio in Atlanta. They planned to prepare for their live performance in front of Fuel Records, but they quickly realized that Godfrey’s place wasn’t adequate for rehearsal. They needed a better place to practice for a couple off months. They also hoped to add some music to their repertoire, for a standard 45-minute set. They started considering their options. Gavin and Godfrey still had contact with their childhood friend, Stephen Buckle, who had a small studio in his ranch-style home in Boerne, TX. They asked Stephen if they could prepare for Fuel Records in Boerne, and Stephen invited the three band members to come out. It was during this first trip to Boerne that Saints of Valory began to discover themselves as a band. 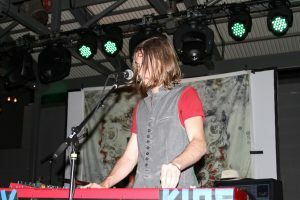 The rough, live recordings that came out of Stephen’s home at the end of June 2009, during what became known as the Guthrie Road Sessions, were the genesis of Saints of Valory’s sound. If you’re a true Valory fan, try to get a copy of one of these recordings. Rumor has it that Godfrey still has them. Shortly after the Guthrie Road Sessions, Gavin and Godfrey received some saddening, yet interesting, news. In July 2009, a man named Jonathan who had musically mentored Gavin and Godfrey when they were still kids growing up in Brazil passed away in Washington D.C. Jonathan left a cache of musical equipment and instruments to Gavin and Godfrey. The duo stopped in D.C., picked up their new gear and headed back to Godfrey’s studio. The boys had work to do. These songs were versions of the live Guthrie Road Sessions they had recorded in Stephen’s studio. Godfrey’s studio wasn’t large enough for a drum set, so the band went to Spotlight Sound Studios and recorded the drum track there. They took the drum track back to Godfrey’s apartment, where the mix was finished. Gavin, Godfrey and Gerard finally had a decent set of recordings. They would make a demo CD and mass mail it to as many places as they could think of. Equipped with original music, decent instruments and equipment and a solid demo CD, things were going fairly well for the group. But in less than a month, that all changed. Sadly, in September of 2009, Gerard’s father was diagnosed with cancer. The news hit the band hard and their future became uncertain. For obvious reasons, Gerard needed to spend time with his family. By Christmas 2009, the band members had returned to their respective homes. The uncertainty of Gerard’s presence with the band came as a nearly devastating blow. Everything that seemed to have a direction and purpose was now up in the air. The only direction Gavin and Godfrey knew to move in was forward. Godfrey had taken on the role of sending out the emails and demos that they had recorded to as many contacts as he could. It was like baiting a hook to see which fish would bite. On January 10, 2010, the band got a nibble. Kayrn Scott, who was with Flyer Records in Austin and had signed local band Alpha Rev, replied to Godfrey’s email. She expressed interest in Saints of Valory and mentioned that she’d like to come out the next time they were playing in Austin. The level of interest from Karyn and Flyer Records turned the group’s attention toward Austin as somewhere they needed to be. But the timing wasn’t right yet. Things with Gerard’s father had taken a turn for the worse, and there was no way for the band to even consider a trip to Austin at this time. Two days later, on January 12th, Gerard’s father passed away. As a result, Gerard made the difficult decision to take a break from the band. He needed to provide for his family by working at their family restaurant in Monterrey. During this time of of instability, moved by emotion, Gavin Jasper wrote the hit “Providence” while in Brazil. Gavin went through a short period of depression. He found solace in music, influenced by bands like Phoenix, White Lies and Alberta Cross. His musical style began to morph. In February 2010, Gavin called Stephen to tell him that he had this sound in his head that was a lot more melodic than what Saints of Valory was used to. However, Fuel Records didn’t end up liking the new sound. They wanted Saints of Valory to continue to develop their initial pop rock sound, which was akin to Audioslave and the Foo Fighters. The Saints of Valory weren’t down with that. They took a stand for their music. Boldly, the boys decided that with or without Fuel Records, they were going to chase their dreams. At the end of February 2010, Godfrey went to visit Gavin in Rio. Stephen, not yet an official member of the band, went along for the trip. Gavin and Godfrey met to discuss their new sound, figure out what they were going to do about a drummer while Gerard was with his family, and ultimately look at all their options, including playing live for Flyer Records in Austin. It was during this trip on February 25, 2010 that Stephen’s addition to the band on keys was first discussed. Nothing firm was determined by the end of the guys’ time together. Stephen returned home to Boerne, and Gavin and Godfrey went to Atlanta. At the beginning of March 2010, with uncertainty regarding their drummer, a new sound and no label, Gavin and Godfrey were still in unfamiliar territory. They wanted to check out the live music scene at SXSW, so they left Atlanta, drove to Boerne and met up with Stephen. Keep in mind that they were going to SXSW not as performers, but as fans of live music themselves. Gavin, Godfrey and Stephen, went to 6th Street and started following the music. They stumbled upon local band the Rocketboys, who gave them the lowdown on the Austin music scene and some very helpful tips. They also happened upon a couple of their heroes, the guitarist and bassist of The Killers, who were playing an unannounced show for about 20 people. Energized from their experience, the band returned back to Stephen’s place “pumped” to write and record some new music. March 22, 2010 found the band writing and rehearsing in Stephen’s Boerne studio. They were ready to record. Gavin, Godfrey and Stephen reached out to Gerard, still in Monterrey with his family, and asked him if he would come record with them. The band members had been long-time friends with Stephen, and he was already like family to them. Gavin, Godfrey and Gerard liked the chemistry and invited Stephen to play with them, to see what it was like adding keys as a permanent fixture of their sound. On April 4, 2010 Saints of Valory officially added Stephen to the group. Just 14 days later on April 18th, Saints of Valory performed live for the very first time ever. The show become known as the “Driveway Concert,” aptly named for having taken place on the driveway of Stephen’s Boerne home. Not long after the driveway concert a friend of Godfrey’s, who was a bartender at Agave on 6th Street, gave Saints of Valory their first official show on April 23, 2010. Gerard was with the band for this show, but still hadn’t committed to being a permanent member because of his family’s need for his help. Something interesting happened at Agave that night which pushed Saints of Valory to take new risks. An “Angel Encourager” approached them, a man who the band never knew before and has never been seen again. They didn’t even catch his name. But the man told the band that they were too good to be playing on 6th Street, and that they needed to book shows at more prime locations like Stubb’s or Lucky Lounge. 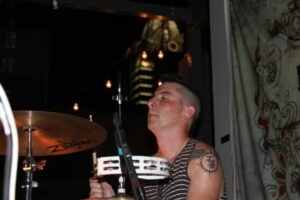 He emphasized that they had what it takes to make it big and they needed to take their shot, if they wanted to get to the next level as an Austin band. Karyn from Flyer Records was supposed to go to the Agave show, but she didn’t make it. This disappointed the band, but ended up being providential. The group was prompted to look for another local booking that Karyn could attend. Stephen continued working diligently as the band’s booking agent. Armed with new information from the mysterious stranger, he was aiming at better venues. Successful in his efforts, Stephen ended up getting the band’s second show booked at Lucky Lounge. The Lucky Lounge show took place on June 9, 2010. Again, Gerard was able to make it out for the show. Someone else showed up as well: Karyn Scott from Flyer Records. Though Karyn didn’t offer to sign them immediately, she did recommend a producer, Dwight Baker, who would end up producing the band’s first two EPs. On the heels of their momentum from the Lucky Lounge show, the band began to talk about moving to Austin as a serious step toward their future. But just one week after the show, on June 15th, Gerard informed the band that he was leaving for good. It wasn’t personal; it had just become too difficult to juggle his family’s need and the band’s increasingly demanding schedule. The remaining members were in a challenging situation. They were talking about a significant move to Austin, they had experienced a measure of success and they had connected with record producers. But their drummer had officially quit. The remaining three members of Saints of Valory decided once again that the only direction to head in was forward. They made the decision to return to their respective homes, wrap things up and move to the Live Music Capital of the World, to work on their craft together full-time. This was a huge risk for everyone involved. By August 2010, Godfrey had moved to Austin and Stephen had landed a show for the band at Stubb’s for early September. But they still didn’t have a drummer. Godfrey’s brother was a drummer, and the band reached out to see if he could come play with them. But his brother couldn’t make it. Not knowing who else could do what their former drummer could do, they contacted Gerard once again. Gerard agreed to come up for the Stubb’s show to help the band out. By early September 2010, Gavin and Stephen had found an apartment in Austin together. Godfrey was already in Austin and Gerard was in town for the show. 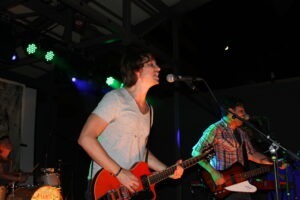 On September 4, 2010, Saints of Valory performed live at Stubb’s to a crowd of around 200 people. September 12th, pre-production work began for The Bright Lights album produced by Dwight Baker. Gerard had also agreed to record the tracks along with the group. From September 20-26th, Saints of Valory recorded The Bright Lights album. Four days later, they performed a small show at The Parish, playing some of their new material from the album. In the midst of all this, Gerard was juggling everything he had on his plate. At the same time, the realization of the potential of the band was weighing on him heavily. Saints of Valory released their first album, The Bright Lights, on November 29, 2010. They had recorded eight songs in six days at Matchbox Studios in Austin. 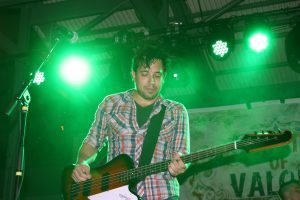 On December 3rd, Saints of Valory held their debut CD release party for The Bright Lights EP at Antone’s. Gerard showed up with a huge tattoo of the SOV logo from the album tattooed across the left side of his chest, signifying he was back for good. The Antone’s show was part of a fundraiser for mental health, and Saints of Valory opened for Alpha Rev. During the show, the boys gave away over 200 copies of their new album for free. According to Gavin and Stephen, 2011 was an “amazing” year for the band. They were approached by a small radio promo company out of California that thought “Providence” was a fantastic song. The company wanted to push it. “Providence” eventually broke #50 nationwide on the AAA charts. Saints of Valory was the only unsigned band this high on the charts. It was at this point that the group started receiving a lot of attention from major record labels. No deal ever materialized, but the band said they’re happy it didn’t. As independents, they have been able to develop at their own pace. They do admit that their booking is getting busier every month and they’re entertaining the idea of bringing on a solid national booking agent. In March 2012, the Saints of Valory were selected by Billboard as one of the top six unsigned bands nationwide. On May 26th, they held the CD release party for their sophomore effort Kids at The Belmont on 6th Street, with Maggie Koerner and the Slow Burn opening. The show was packed and was a great success. The artwork for the album Kids was done by popular local Austin artist William K. Stidham. Kids broke into the top 200 Rock albums on iTunes, with 1,700 copies sold in the first week. During our interview, I asked Gavin and Stephen who they’d want to be on stage with if they lived in a perfect world. They didn’t hesitate: “The Killers.” Later, Godfrey agreed. Gavin and Stephen added that Gerard would have definitely said Muse. I had a great time interviewing these guys, and true to their “lucky” nature, this interview almost didn’t take place. I am glad to have been the first to catalogue their story. There is no telling how far this foursome will go. They have a great sound, perseverance and a ridiculous amount of luck. Guess it takes all three to do what they’re doing. We have a pair of tickets for Saints of Valory’s August 24th show at Stubb’s. To be eligible to win, just subscribe to our free email newsletter, Best of the Austinot. We’ll send contest details to our subscribers soon. Make the most insightful comment. The Austinot team will determine the winner. Do you have a favorite Saints of Valory memory?